Each November, VAC prints a commemorative booklet containing recent events and history of the church. 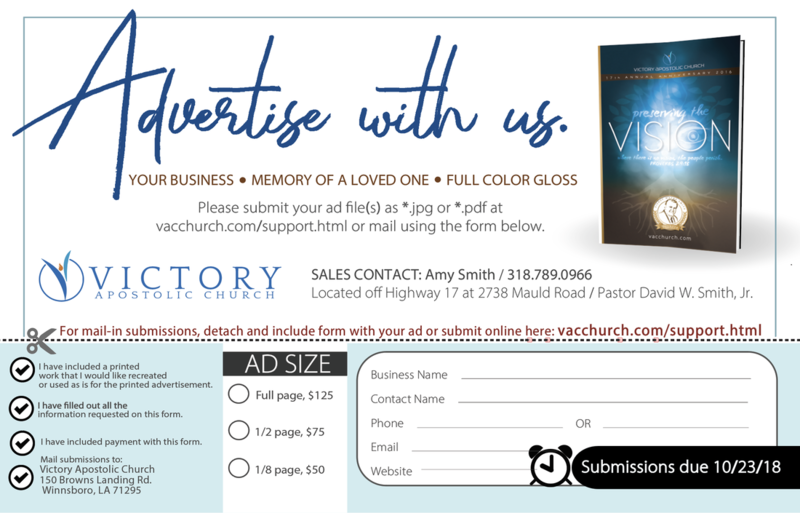 Both businesses and friends are invited to advertise or create a memorial within the book each year. New in 2018: Finished book has full color and full bleed interior pages 8.5" w x 5.5 h (landscape) printed on 100 lb gloss pages. Reserve your advertising space by submitting your information below. Your will be prompted to pay online or check by mail after information has been submitted. Your phone number will only be used for any possible questions regarding your submission. or if any information is missing in your submission. Please upload your image files below. 8.5w x 5.5h with 1/2" bleed. If we are creating the ad for you, please include instructions above and all images required. ​Contact amyrie@earthlink.net or call 318.789.0966 with any questions.